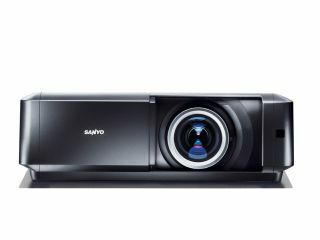 Sanyo introduces the PLV-Z60, a 720p LCD projector that features the company's 3D color management system, a high contrast ratio of 10,000:1, an installation-friendly lens shifting function, and many of other features for this home theater projector. The PLV-Z60 is equipped with three wide 16:9 HD LCD panels that produce a 1280 x 720 pixels (2.76 million) image. A 12-bit digital processing IC provides video decoding, scaling and gamma curve generation with a 10000:1 contrast ratio. To facilitate ease of installation and operation, the PLV-Z60 is outfitted with Sanyo's advanced lens shifting function and a 2x optical zoom, which allows projection of a 100 inches image from only 9.8 to 20 feet away. Fine-tuning of image settings including hue, gamma curve and color levels, enables compensation for specific conditions in any environment. A full compliment of input terminals is provided, including two HDMI connections, two sets of component video inputs, along with composite and S-video connections to ensure maximum flexibility with all types of components. The D-Sub 15 input is provided for direct connection of a PC. The PLV-Z60 will be available this month for an MSRP of $1,295.